The other day, I was on the phone with a charity that I wanted to donate old furniture to. I had already arranged a pick-up date with them, but there was some miscommunication and I was asked via an email to get in touch with them. When I made the initial arrangements, I spoke to a very helpful English lady who assured me everything was in place for the pick-up. With my second phone call (10 days after the first call) it turned out that the date for pick-up date was never confirmed or booked with the removal company. Needless to say, I was a bit frustrated. One, because I don’t like dealing with call centres and two, because I felt that my time had been wasted. At this point, I nearly burst out in laughter, because I know that the French are outright people and they say things exactly how they see it… Had I not had a bit of insight into the French demeanor, I could’ve possibly been offended by the French lady’s forthright response. However, after day 6, I became a bit suspicious and I asked myself: Is it possible that people can be so helpful and friendly all the time? Where are the nuances of slight annoyance, irritation and perhaps even the odd passive-aggressive rolling of eyes? These are human emotions that I see being expressed (sometimes more amplified than necessary) in my hometown, London. Is this because as a native South African I’m accustomed to wearing my heart on my sleeve? Is it in my “cultural DNA” to speak my mind frankly? (Even though, experience has taught me that this cultural trait is not always warmly received. In fact, in one of my first jobs in the UK, I was sent on a course to help me be less assertive). The point I’m trying to make is that when we live and work in multi-cultural environments, a lot can get “lost in translation” and this could lead to confusion, embarrassment, misunderstandings, offence, and a breakdown in communication. The same applies to businesses, especially when you are working with multiple stakeholders across various continents. From Japan, to India, to Spain, to Switzerland, as a global group of businesses, The Agora companies are in partnership with businesses and teams who often share cultures that operate in very different ways. The question is, how do you lead and collaborate with teams that span over various continents and nationalities, and have very different ethnical and cultural values? In her book The Culture Map, Erin Meyer sets out to answer this question. Based on her own academic research, supported by the work of leading psychologists and anthropologists, Erin Meyer provides a framework for businesses to help them understand and manage the growing challenge of navigating cultural differences in the workplace. With the focus on subtle cultural nuances, Erin Meyer uses a field-tested eight-scale model to help analyse and understand eight key behaviours that can present some challenges in international teams: communication, evaluation, persuasion, leading, deciding, trusting, disagreeing and scheduling. 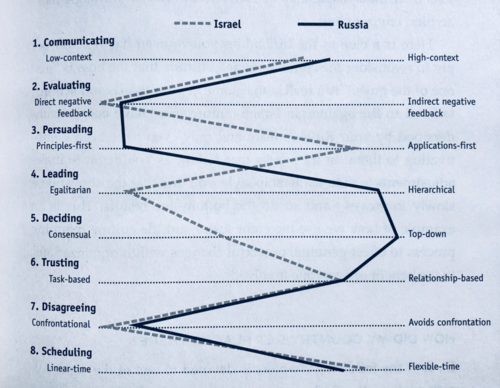 The eight-scale model, comparing Russian business culture with Israeli business culture – Source: The Culture Map, Erin Meyer. The example above, shows how cultures can vary from one extreme behaviour to its opposite. By using Meyer’s culture map to decode how culture influences cross-continent collaboration, businesses can easily see where invisible cultural boundaries are most emphasised. For instance, if you look at the scale above it’s clear that both Russian and Israeli businesses value flexible scheduling rather than following a more rigid schedule. However, when it comes to leadership, Russian business culture promotes hierarchical leadership, which is the opposite from the Israeli egalitarian leadership style. Knowing about this significant difference in leadership can help both avoid potentially painful situations. The Culture Map also offers strategies for managing these potential fault lines. Take communication, for instance. What makes a good communicator in different societies? Meyer’s culture map indicates that the two polar opposites of communication are low or high context. Low-context cultures, like the US or Germany, communicate in precise and in clear language, leaving little room for guesswork. High-context cultures, like China or Korea, communicate in more nuanced messages, implying rather than plainly expressing. So, when German and Korean businesses communicate, there is a clear potential for confusion. In this instance, Meyer offers the following solution: Leaders of international teams should encourage members to remove ambiguity by moving towards low-context processes, setting ground rules to communicate explicitly and, where possible, put things in writing. These two examples that I’ve highlighted barely scratch the surface of the depth of knowledge and practical solutions that Meyer offers to businesses that want to succeed in a global world. Her primary message is to simply be aware of cultural differences in the first place and to encourage awareness. Diversity can be a hugely positive factor, but it must first be understood and then managed effectively. In a world where businesses are increasingly connected digitally, the missing link – the determining factor – between success or failure is having the knowledge and framework of how to navigate and overcome cultural differences within teams and organizations. The Culture Map will definitely help you cross these invisible cultural barriers.